Daley made his Super 14 debut off the bench against the Crusaders in 2008 and quickly became a regular in a young Reds pack. A World Championship winner at Under 19 level with Australia, Daley wore green and gold at Under 20 level before making a mark on Super Rugby in 2010 when he started 12 of the Reds' 13 games as they enjoyed a brilliant season. Following injuries to Benn Robinson and Ben Alexander, Daley was promoted to the full Wallabies squad for June Tests against England and Ireland. In the first Test against the English in Perth, his debut, Daley was part of a front-row that leaked two penalty tries at the scrum. Coach Robbie Deans kept faith in his young trio and Daley fared better in the remaining games. 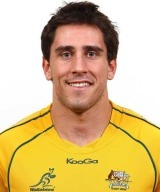 He is the son of former Australian rugby league international Phil Daley.